When I hear the word ‘Fiat’, I think of a nice little Italian car brand. And I believe you also think the same. But ‘Fiat’ also means something that you wouldn’t like if you understand the meaning of it. …a meaning that you will regret, you had known earlier. That’s why in today’s post I am going to share what fiat currency is…why it is bad? And what you could do to opt out of its disadvantages. What Is Fiat Currency or Fiat Money? Apart from Fiat car manufacturer, Fiat also means by a formal authorization or proposition; a decree. And a currency that comes into existence due to this authority, declaration or decree is called fiat currency or money like USD, EUR, etc. Yes, fiat currency or fiat money. But there is a fundamental difference between money and currency but here fiat currency and fiat money are used synonymously. So you see what does fiat means…but many people are still unaware of this fact and think their paper money or currency like the USD, EUR or GBP are backed by Gold yet!! But sadly, no it is NOT. Back in the good old days before 1971 all the paper money or currency of the world was backed by either gold or US dollar (which was in turn backed by gold). If you see this above note clearly states that it is a gold certificate and 20 dollars worth of gold coin is payable to bearer on demand. Whereas in the below US dollar note, it is legal tender only because the federal reserve says so. And it is by the US government’s decree that this paper is worth of 20 US dollar goods and services. Now, I know if you are not a US citizen, you would ask, how it is related to my country? 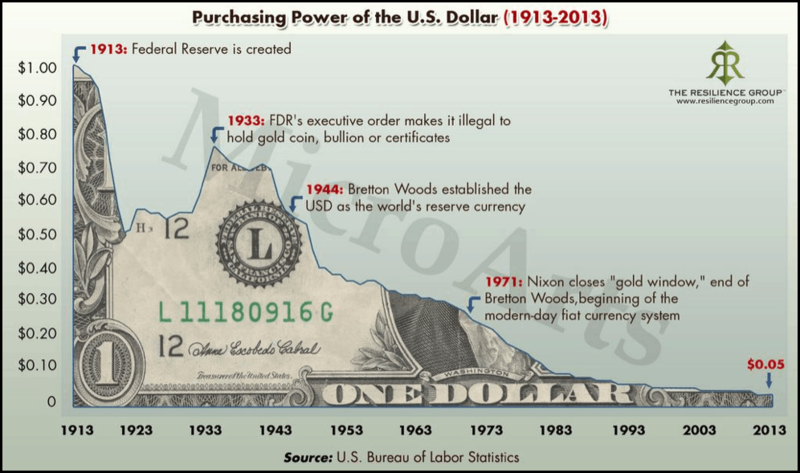 Before 1971, the world’s financial system was governed by the Bretton Woods System which specified that all the currencies of the world will be backed by US dollar and US dollar will be backed by gold reserves. But when in 1971, President Nixon ended the gold convertibility of US dollar and other currencies, all the paper currencies of the world became fiat instantly. So this is how fiat definition of money came into the picture and I hope now you will be able to define fiat to anyone. Fiat currency has lot many disadvantages and one of the most important is-Inflation or Hyperinflation. And as I implied before that fiat currency is not backed by anything other than government’s decree so this becomes great news for the government because now they can print any amount as they want for its expenses on wars, social security, or bailouts. But this is where it gets nasty guys. Because now as the supply of dollars or paper currency increases its value depreciates over the period of time. So here is the reason right in front of your eyes, why fiat currency is bad !! I think by now it is clear that fiat money is worthless pieces of paper for which people give-up their whole lives. But what’s the alternative to fiat currency? Well, the alternative is, of course, Gold, as I have stated previously. But Gold markets have also been manipulated to a certain degree. That’s why you need a form of money that is even harder than Gold and that is Bitcoin. Unlike fiat currencies, Bitcoin cannot be printed or mined as per the needs of any centralized party. Bitcoin has fixed schedule and a robust monetary policy built into its system which makes it resilient to any manipulations. It is also backed by hard and complex energy intensive math problems which take a significant amount of time and resources to be solved. This is the only way through which new bitcoins come into existence every 10 minutes. Thus it is different from fiat which is backed by nothing more than the hollow promises of governments around the world. Now, needless to say, when you have learned about the difference between Bitcoin vs Fiat, you should definitely inquire about how bitcoins can be used for a system that is better than fiat. Bitcoin democratizes the concept of money by taking power back from the governments and banks. Bitcoin can help in building more freer capital markets than we have created from fiat. Bitcoin is inflation proof which is not the case with fiat. Bitcoin moves faster and is quicker than fiat currencies for payments. If this all happens with Bitcoin, what we would be creating? Needless to say, we would be creating a fairer world where all can co-exist together without worrying about their wealth and prosperity because whatever value they will be creating, will get captured in a fair form of money or currency, i.e. Bitcoin. I will go for Bitcoin, what you will chose? Do share with us in the comments section below.